It was called Action Park, a very appropriate name for a fun filled theme park with thrilling water rides. And all probably would fondly remember it were it not for the fact that so many people died there. What do you expect when you have a WATER slide that goes upside down? I went to Action Park with my summer camp. Two busses filled with 12-14 year olds coursing with hormones. The girls chattering about what bathing suit they were going to wear. The guys salivating at the possibility of seeing the bathing suits the girls were going to wear. What nobody talked about however was what they were going to wear on their feet. It was a water park. Everybody would go barefoot. Hang on guys I gotta go buy some aqua socks. You have to, wait, what? But not to Nino. 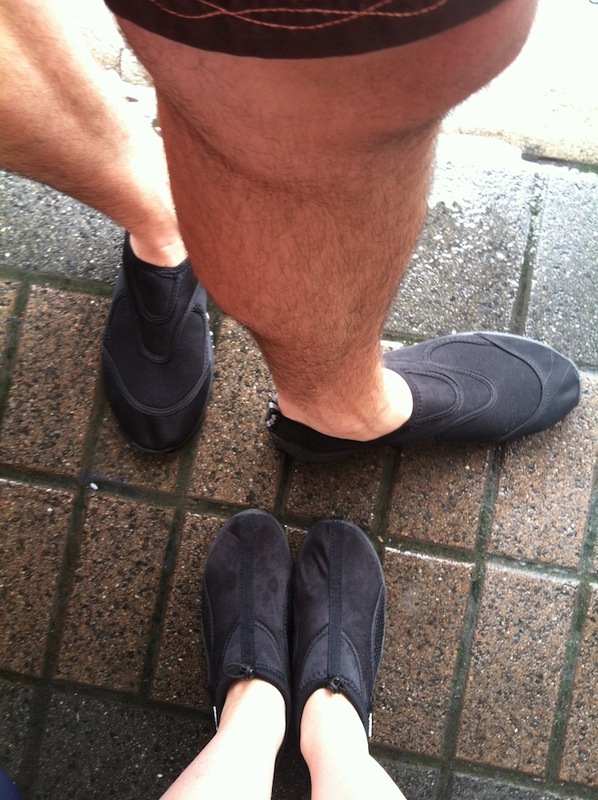 He wasn't in the market for water shoes; the guy wanted some aqua socks. It was like my 13-year-old friend had just turned into an 89-year-old man complete with osteoporosis and flat feet. I judged Nino, fully. Maybe it was because he was about to purchase aqua socks. More likely it was because I was insecure and being different was bad. Nino got his aqua socks. In fluorescent green if I remember correctly. Sure I made fun of him but I am almost positive at an earlier point in my life I had owned my very own pair of aqua socks, just like I also owned a pair of water wings. Water safety was very important in my house. I wore Waterbabies sun block until I was in college. But that’s another story. After Nino purchased his aqua socks I never gave much thought to aqua socks except to bring them up as the punch line of some garment related joke. Water shoes were never part of my life again. I never considered them, I never needed them. That is until August 9th 2012. Roughly 15 years after Nino demonstrated his courage in purchasing a pair, I too purchased a pair. Well for my 29th birthday I wanted to do something fun and different. So my girlfriend and I decided to go to Dorney Park and Wildwater Kingdom in nearby Allentown Pennsylvania. Dorney Park is another theme park I remember fondly from my childhood. It is a theme park with roller coasters and water slides just as fun as Action Park without all the deaths. We took the day off work, rented a car, and got ready for a day of fun in the sun. But the last time I had been to a water park was 8 years ago for my 21st birthday (I'm a child) and my body has changed a bit since then. And not for the better necessarily. While I'm not an old man by any means, I have aged since the last time I voluntarily walked around all day half naked and barefoot. And additionally, I have special feet. So we looked them up online and believe it or not Kmart had what we needed. Ten bucks a pair! You can't beat that deal. Well as it turns out when my girlfriend went to pick them up, they were buy one get one HALF OFF. So that was TWO pairs of aqua sox for $15 dollars. That's 7.50 a pair. They were practically giving them away! I had come a long way from the kid who made fun of Nino. In fact I was now like Nino squared. Because the only thing dorkier than buying your aqua socks at the water park is buying them BEFORE you get there. I had gone from aqua socks number one opponent to their number one advocate. Dorky at 13 is good thinking at 29. It's amazing how things change. By the time we actually get to Dorney Park it is pouring down rain. This is putting a potential damper on our plan to spend half the day riding roller coasters, change into our bathing suits and aqua socks, and spend half the day on water slides. We had gotten there a half hour before the 10 am open in anticipation of lines. We wanted to get a full day of fun and planned on not leaving until 8 pm. A funny thing happened though. It never stopped raining, but all the rides stayed open. So we made a wise decision, we put on our bathing suits and aqua socks before we even got out of the car. This turned out to be the best decision because not only did we not care about getting wet, but also the rain kept everybody away from the park. It was empty. This meant that within 90 minutes of the park opening we had ridden every roller coaster we had set out to ride. No lines, no waiting. The rides we went on were never more than half full. And even though while taking a corkscrew turn at 75 miles an hour the rain feels a like bit like shrapnel, we still were as happy as could be. Our feet were covered, we didn't care if they got wet, and we got to do everything we set out to.